Tea Rose Home: Link Love No 41! Let me tell you how grateful I am for all of your kind comments about my ruffle shirts feature on Altered Couture. You guys are so supportive and awesome! :) Thank you so much everyone! This link party I saw lots of Valentine projects. Hmm... Something must be in the air. Here are my picks for this week! Nette is new to the TRH link party, I am so happy that you came! She made this pretty house sewing box. I love the color combinations; it is all happy and cheerful. 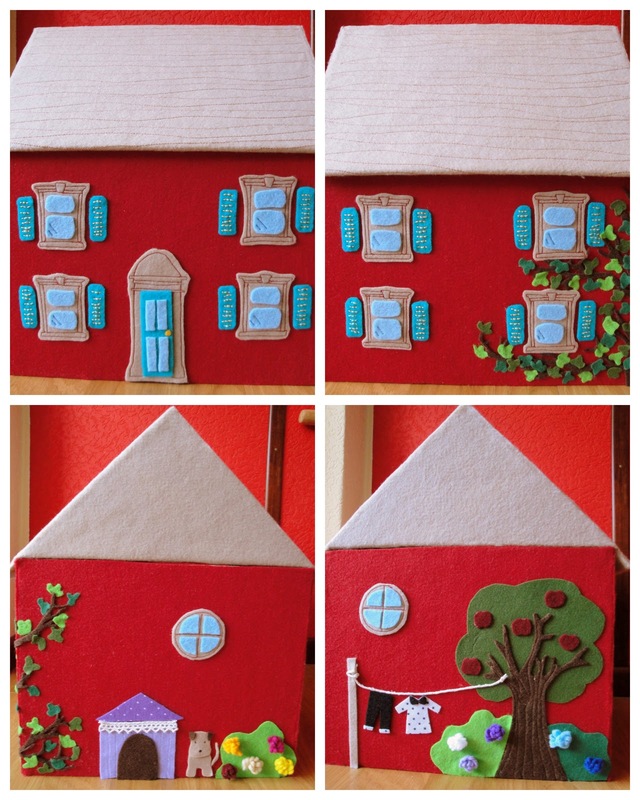 Go visit her blog; she posted a video of how she made this sewing box. It was so cool. How cute are those?! 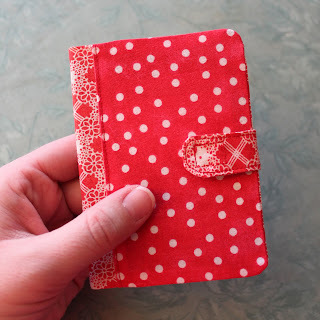 Obsessively Stitching shared a step by step tutorial on how to make this covered notebook. I saw these mini notebooks at a dollar store a couple weeks ago; I knew I should have grabbed them. These notebooks will make the perfect gift for any occasion! JAQS Studio shared a Kohana quilt with us. To show off the pretty fabrics, she made a simple square quilt. 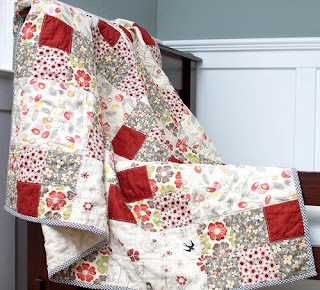 I love the fabrics used in this quilt, and I was looking closely at the picture, and noticed that this is hand quilted. I love quilts that are hand quilted. I know machine quilting is quick and amazing too, but there is something about hand quilting. I love looking at how the stitches go in and out throughout a quilt. I feel like there is warmth you can't express with a machine. Beautiful! I LOVE this shirt! It is not a question; it is a statement exclaiming, "He loves me". Flamingo Toes shares a wonderful tutorial in her blog on how to make this He Loves Me Valentine shirt. I love projects like this, it is not over the top difficult to do, but it has the "wow" effect. So fun! This beautiful lamp was shared by Mama Says Sew. This lamp appeared in the crafting with the stars, and it was one of my favorite projects. I want one for my home! Thank you for linking Terra! Thank you all for coming over to another link party! See you at my next post! I recently binded a hand-quilted quilt for a woman who's grandmother (the maker of the quilt) had died. I'd never seen one up close! It was really cool. Maybe I'll try it one day. What a great group of projects. I LOVE that sewing box! I am totally new to your blog and am happy for having contributed. Your page is wonderful. Keep up this inspiring work!